People with TSCI or Traumatic spinal cord injury suffer profound physical, functional and emotional consequences. However, many people with TSCI want to maintain self-reliance, to be in control of their own comfort and be part of their own care. To address this need, there is a new breed of innovative products developed for those who have lost mobility but not their independence. 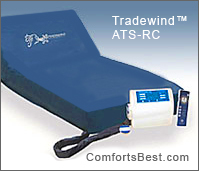 The Tradewind™ ATS-RC is comprised of a heavy-duty alternating pressure, low air loss mattress with a quiet dual compressor digital pump. The mattress features a supple cover with a multi-directional stretch cover that is low shear, anti-microbial and anti-bacterial. Made to fit a standard hospital bed, Tradewind™ ATS is available in 35″, 42” & 48” with models to support up to 750 lbs. With the innovative Tradewind™ ATS-RC, the loss of mobility does not have to mean a loss of control, comfort and independence. With Remote Control Alternating Air Pressure Mattress System With Low Air Loss.